In order to understand the causes of insomnia, we need to have a look at how the sleep cycle works. The amino acid L-tryptophan (found naturally in certain foods) is converted into 5-HTP and used in the manufacture of a neuro-transmitter called serotonin. Serotonin, in turn, is transformed into a sleep hormone called melatonin by the pineal gland in the brain. The pineal gland only becomes active after dark. By regulating levels of melatonin, our bodies create the 'sleep-wake cycle'. Of course the process is more complex than this and there are other things that could contribute to sleep problems. However, sufficient production of serotonin and melatonin is crucial in promoting and maintaining healthy sleep. Medical science recognizes the strong association between good health and good quality sleep. Unfortunately, due to lack of understanding and limited time, many conventional doctors do not take the time to investigate what the cause of a sleep disturbance might be and simply write out a prescription and send the patient on his or her way. This is not always the best long term solution. Doctors usually prescribe antihistamines (e.g. Nytol, Benadryl) or a class of drugs called benzodiazepines (e.g. Valium, Lorazapam, Alprazolam, etc) to treat insomnia. While these drugs may be effective in the short term, they can both cause serious long term problems, including addiction and disturbance of normal sleep patterns. Benzodiazepine addiction, in particular, can develop very quickly and using them for longer than a week or two may result in a lifetime of dependence. Using strong drugs to fall asleep often means that the body's natural sleep cycle is disturbed and the ability to fall asleep naturally is lost. The person often needs to take stronger and stronger medication in order to fall asleep at night. Grogginess in the morning is not uncommon. Naturopaths recognise that sleep is like a barometer. When someone consistently struggles to sleep, this is a sign that something is wrong and needs to be investigated. Perhaps there are problems at work or in a relationship. Perhaps there is a depression that needs to be treated. Maybe there is a serotonin or a magnesium deficiency which needs attention. Maybe there is another condition which is causing the sleep problem. Simply taking strong drugs to fall asleep is not enough and can further complicate the picture. There are many different 'natural' remedies on the market. Not all of these are as 'natural' as they claim to be. Others are not very effective due to inferior formulation or failure to take a more detailed and scientific approach to the treatment of insomnia. Unfortunately this has meant that many people have given up on finding a healthy, natural approach to insomnia. For people who suffer from chronic insomnia (regularly more than once a week) and who struggle to fall asleep as well as remain asleep (sleep-maintenance insomnia), it is important to take a long term approach, rather than struggling every night to find ways to fall asleep. Chronic insomnia is often linked to low serotonin levels caused by depression, anxiety, dietary deficiencies, chronic illness, prostate problems, menopause or being over the age of 60. Insomnia may be almost a nightly battle and you may also wake up in the middle of the night and early morning. People who suffer from chronic insomnia and fall into any of these categories, will need a more long term solution to their sleeping problems to balance serotonin levels and restore healthy sleep patterns. Natural remedies have a long history of use for the holistic and effective treatment of chronic insomnia. Serenite Plus is a combination herbal/homeopathic formula especially formulated to treat the symptoms of insomnia, especially sleep onset insomnia (difficulty falling asleep) and occasional insomnia (i.e. not more than two or three times a week). Serenite has been used safely and effectively for many years to help with sleep problems. Now newly formulated, using up-to-date scientific knowledge of insomnia and natural sleep patterns, Serenite Plus combines herbal AND homeopathic remedies in a new improved formula. "I have tried many natural products to try and help me to sleep. None of them has helped me like Serenite Plus." "I am a pensioner and for the last 6 years, I have not been able to fall asleep as I used to do. Maybe it is because I am not as active as before, although I try and walk a little with the dogs every day! I have been very pleased with the results of your remedy, which relaxes me and helps me to fall asleep. Thank you for answering all my questions!" "After some relationship troubles I found myself worrying and obsessing every night and no matter what I did I could not let go and fall asleep. This remedy really does the trick. It feels just like natural sleep because I become drowsy and relaxed and then can't remember when I fell asleep. No problems in the morning when I wake up - unlike the tablets my doctor gave me once before and which I took only once!" Serenite Plus comes in easy to administer drop form and is diluted in about 1/4 glass of water or juice. Adults and Teenagers over 15: 15 to 20 drops five minutes before bedtime. May be repeated during the night. 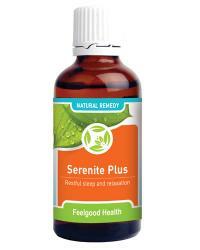 NOTE: Serenite Plus is very effective in the short term treatment of insomnia. People with chronic insomnia and those with sleep maintenance insomnia who would like to treat the underlying causes of their sleep problem, should consider combining Serenite Plus with Serenite-LT Tablets for a long term solution to insomnia. See our Inslumbia Aromathrapy range for peaceful relaxation and sleep! Due to the fast acting tincture formula, initial results should be noted within about 10-15 minutes. Depending on frequency of use, one bottle of Serenite Plus can last a month or longer. Insomnia Fighter! Herbal remedy to help you fall asleep plus long term insomnia support!